This past weekend I had the pleasure of doing an interview and live performance on iHearIC (KRUI 89.7 FM) in Iowa City. Check out the recording of it here! My good friend Izzy Yellen wrote a really nice review of Shadow Sets as well as a nice review of a solo concert I did in Appleton a few weeks ago during the spring blizzard of the century. Check it out! 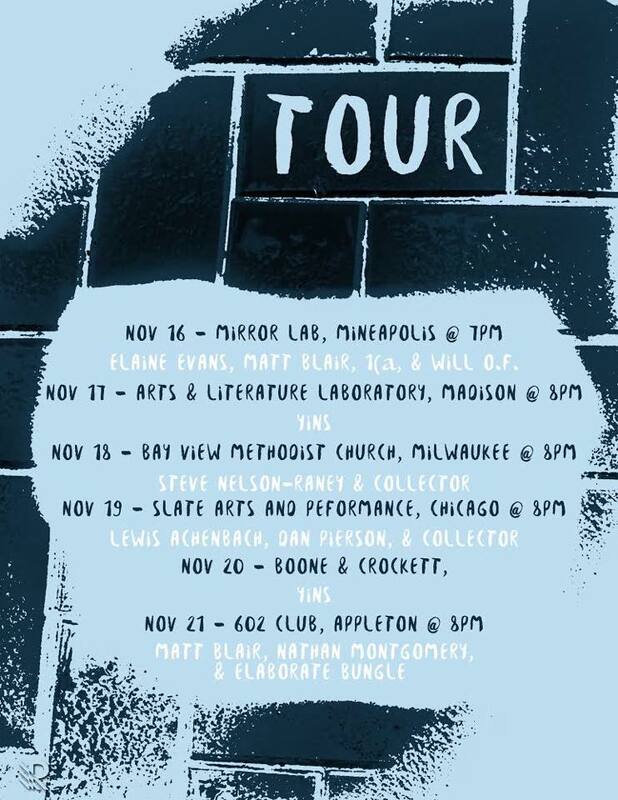 Shaper hits the road this week with shows in Minneapolis, Madison (YINS will be playing too), Milwaukee, Appleton, and Chicago! Shaper is a Minneapolis-based quartet that performs original music and collective improvisations. Having no one leader, alto saxist Will Fraser (Wild Firth), pianist Matt Blair (YINS, Collector), bassist Ryan Hays (Sister Species, Matra), and drummer Jack Lussenden (Good Trouble) explore dynamic interplay to create songs and sounds. Heading out for a short tour around the midwest tomorrow! Thanks as always to Ross Potter for the poster. Hope to see you out there! Really excited to have a Tuesday night residency with my quartet at Palmer's Bar this month! We'll be playing Nov. 7th, 14th, and 28th. Hope to see all you Twin Cities folks! Scott Gordon at Tone Madison wrote a really nice preview of my upcoming solo album, which is to be released later this year. Check out the preview HERE! Hitting the road in a few days for a solo tour around the Midwest! Hope to see you along the way. Thanks as always to Ross Potter for the poster! hello internet world! Looking forward to doing a short trio run with the mega homies Jakob Heinemann and Devin Drobka. Hope to see you! Big thanks to Ross Potter for the poster! Devin and I will be playing at the fourth annual Bay View Jazz Fest this Friday, June 2nd! We play at Boone & Crockett at 5 pm. We are really looking forward to this and super excited to share the bill with so many great musicians! Hope you can make it out! Devin and I will be trading solo sets and then playing duo. Blair/Drobka Duo featured as one of the headliners for the LUaroo Music Festival. Hello world! I'm super excited to finally get my website up and running! Please come in and take a look around. I have some exciting shows coming up this spring so hop on over to the upcoming events page and check it out. I would also like to give an extra shout out to Mariah Griffin for doing such an amazing job with all of the photos you see on the website. If you need photos for anything check out Mariah's Instagram account and get in touch with her there. Hope you all are doing well and happy spring! I'm really looking forward to teaming up with my good friend and collaborator Devin Drobka to premier some new duo compositions as we open up for Twin Talk as they pass through Appleton on their 2017 Spring Tour. Music starts at 10 pm in Harper Hall with a $0.00 cover!